The aim of this short video is to announce 2014 as the International Year of Crystallography. Crystallography is that branch of science that is concerned with the investigation of the arrangement of atoms in matter. It is from the basic knowledge of how atoms are linked to each other to form molecules or extended structures that the properties and behaviour of materials can be understood. Crystallography is thus vital in chemistry, biology, physics, materials science, mineralogy, and other disciplines. Hence the title of the video: IYCr2014: What crystallography can do for you. Our commitment for 2014 is to tell the world about the enormous contribution that crystallography makes to society. The video begins with a view of the beautiful Pulpí geode in Almería in southern Spain, Europe's largest geode. The walls of this ovoid cave, which measures approximately 8 x 2 x 2 metres, are coated with huge transparent gypsum crystals.These crystals resemble large blocks of ice, bringing to mind the Greek origin of the word crystal: krystallos, meaning supercooled water. The cave is a magnificent example of the aesthetics of the crystalline world. From the very moment we get up, and with every step we take, there are crystals all around us. We find crystals as components of our toothpaste, as sugar grains or forming the structure of an eggshell, thus controlling its mechanical properties. Crystals are also in the liquid crystal displays of alarm clocks, our mobile phones and our computer screens. Crystals are also in the catalytic converters found in cars, in the snow falling outside or in the frozen foods in our freezer. Crystals are literally everywhere in our daily lives. Our bones as well as our teeth are made of crystals of a type of calcium phosphate, called hydroxylapatite, which forms our skeleton, allowing us to stay upright. Single crystals of calcite (one of the most common minerals) located in the inner ear control our equilibrium. We do not fall down because of crystals! Advances in the discipline of crystallography help to produce not only biocompatible materials mimicking the size and texture of these hydroxylapatite crystals for better prostheses but also new materials inspired by crystal structures that are part of living organisms, such as snail shells, coral or pearls. The vast majority of the minerals that make up rocks are crystals. Snowflakes themselves are nothing but crystallized water. In many cases these natural mineral crystals display beautiful polyhedral shapes with sharp edges that tell us about the internal ordered structure characteristic of crystalline matter. Jewels and semiprecious stones appear mostly as crystallized minerals in nature. Furthermore, the study of the properties of natural crystals improves extraction and processing in modern mining. The vast majority of today's materials such as semiconductors, superconductors, light alloys, non-linear optical elements and catalysts are crystalline, as are materials that are expected to play a role in our future, for example quasicrystals and graphene. New technologies use liquid crystals for watches and telephones, crystals for lasers, semiconductors in the electronic components of chips and LED displays. Every medicine needs to be crystallized to ensure its purity, verify its pharmacological functionality and improve its efficiency. Thanks to crystallography there are new methods that allow us to visualize the spatial arrangement of atoms and molecules and use this knowledge to understand how drugs work and how they can be improved. Conserving precious works of art is a continuing problem because of the materials used. Modern crystallographic techniques allow us to identify these materials and understand the reactions that cause the material to age. Crystals and crystallographic theories play a fundamental role in art and beauty. For instance, the periodic repetition of matter that constitutes crystals creates patterns that are similar to those found in the mosaics of the Alhambra and even today helps to inspire new decorative designs.The concept of crystal and crystalline order and the rationale behind it has always fostered an appreciation towards the natural harmony and beauty of the science, which is clearly shown in some of M. C. Escher's prints in architecture and philosophy. Purist and cubist art as well as the architectural dreams of Le Corbusier that we can see today on the skylines of our cities have been inspired by crystals. ... but few people know that the cosmetics industry exploits the properties of crystals: colour and texture depend on the shape and size of the crystalline phase used in the manufacture of beauty products. We are all familiar with sugar and salt, both of which are crystals. The quality and taste of brown and white sugar depend on how they are crystallized. The prices are different for simple table salt, Maldon salt or "fleur de sel" because they are crystallized in different ways. But you may be surprised to learn that chocolate also contains crystals and that the quality of the chocolate is dependent on how these cocoa fatty acid crystals crystallize. The taste and quality of ice cream depends on the size and shape of the ice crystals it contains. Crystalline pigments add colour to our lives. But surprisingly it is the interference of light with the crystal structure of chitin rather than pigments that gives butterfly wings or birds' feathers their beautiful colours. The exploitation of so-called "structural colours" may play a role in the future of the design industry. The crystallization of fertilizers, soil conditioners and other agrochemicals must be performed to higher degrees of accuracy now new quality-control measures are in effect. Solar photovoltaic panels use crystalline silicon to convert sunlight into electricity. The future of solar energy depends on developing new arrangements of crystals in semiconductors. Zeolites, highly porous crystalline materials, are used in petroleum refinement to obtain better and cleaner fuel. Crystals that form some types of meteorites contain information about the history of the early stages of our planet and solar system. Revealing the mineral composition of Mars, the Moon and outer space is the first step to knowing about the places we may be destined to explore and live. Data on mineral composition is also crucial in answering the age-old question: is there life on other planets? Crystallography provides the technology to characterize the mineral composition and share some of the secrets of other planets and solar systems. Currently we do not have microscopes powerful enough to observe the intimate structures of materials. Thanks to developments in diffraction theory and the ability to crystallize large and complex biological macromolecules, crystallographers are able to reveal the atomic structure of nucleic acids and proteins.Thus we are able to understand the relationships between atomic structure and biochemical function of these key molecules, i.e. how life works at the molecular level. Thanks to these crystallographic methods, crystallographers have revealed the helical structure of DNA, how haemoglobin transports oxygen and how the hormone insulin works. And it is crystallography and crystallographic techniques that have shed light on the structure of the target protein involved in AIDS. The video ends with an animation featuring the two great discoveries on which crystallography is built. The first discovery, in the 19th century, is that a crystal is made up of the periodical arrangement of units of matter (either atoms, molecules or macromolecules) and that, as a result of this internal periodical order, crystals display external polyhedral shapes with precise symmetry. The second landmark discovery in the early years of the 20th century is that the interaction of crystals with a beam of X-rays produces diffraction patterns that contain valuable information about the internal structure of the crystals. Crystallographers have been able to develop theoretical and experimental tools to deconstruct these sets of spots and transform them into images of the atoms and molecules from many types of materials, from common table salt or the most healing medicines to the complex constituents of life: nucleic acids, viruses and proteins. And with that critical information, crucial advances in medicine, materials engineering, chemistry, geology and pharmacology have contributed to and continue to improve social welfare. No wonder then that the Nobel Committee has awarded the discipline 28 Nobel Prizes. 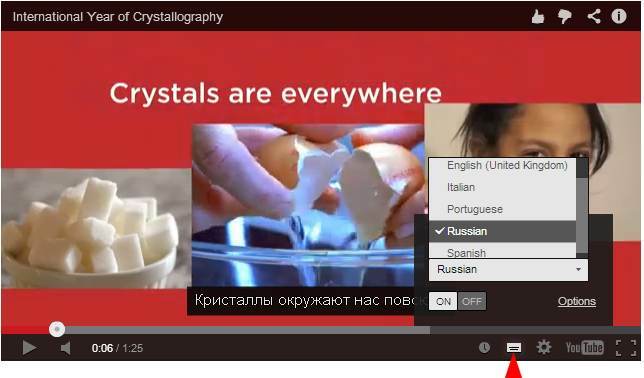 Authorised subtitles for the IYCr2014 video are available in a number of different languages using the "captions" icon in the YouTube interface. Note that additional translations in other languages are available using an automated translator from the "Translate captions" option in the YouTube interface. We cannot provide any assurance about the quality of such automated translations.